This archive holds all posts form December 28, 2011. 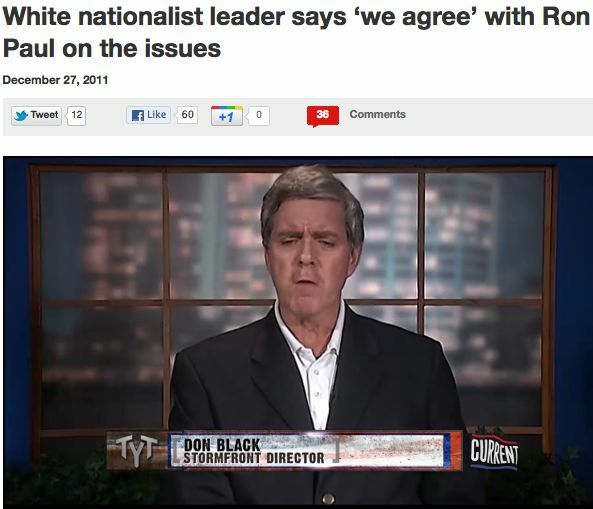 Don Black, the founder of Stormfront, the largest (currently over 236,000 registered users) and longest-running white supremacist site on the web, appeared on the show “Young Turks” yesterday and said that he and many of his followers agree with Ron Paul on the issues, currently a Republican hopeful in the U.S. presidential race. Ron Paul’s newsletters have recently been in the spotlight of the mainstream press in a bit of a johnny-come-lately attack on Paul’s long standing racism and homophobia. In 2007, Daily Kos ran a story “Ron Paul: In His Own Words,” which exposed much of this (and so have many others prior to the current dust up), but this round of attention seems to have been sparked by Paul’s surge in the polls and support among some white liberals and libertarians. There is a tendency, especially among white liberals, to dismiss white supremacist rhetoric – like that of Don Black and those who agree with him at Stormfront – because it exists outside the ‘mainstream.’ I argued in my first book that the extremist rhetoric of white supremacists and the mainstream rhetoric of politicians elected to public office overlap in significant ways. While the standard way of viewing these groups is that they are “fringe,” I contend that much of what they are saying is very similar to what mainstream politicians are saying. Here, Don Black and Ron Paul are simply the most recent example in a centuries-long tradition of this sort of overlap in American politics.